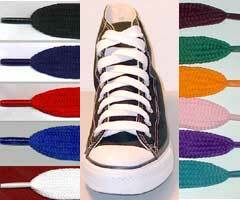 Fat or wide shoelaces are a new look in lacing for your chucks. The ChucksConnection carries a large selection of shoelaces, to meet your fashion or lifestyle needs. Fat (Wide) Shoelaces are 9/16 or 5/8 inch wide laces and Extra Fat (Wide) Shoelaces are 3/4 inch wide and give you that wide shoelace look on your chucks or other sneakers that is currently popular. Wide laces are available in white, black, burgundy (maroon), gold, navy blue, grey, charcoal grey, neon lime, neon orange, neon pink, neon yellow, orange, royal blue, sky blue, yellow, red, brown, light gold, old gold, Kelly green, hunter green, pink, purple, teal, and red, white and blue and come in lengths of 45 inches (for seven eyelet chucks) and 54 inches (for eight eyelet chucks). The ChucksConnection now has fat laces in two colors (black, white) in lengths of 63 inches for nine eyelet chucks. Extra Fat Shoelaces come in black, white, red, brown, and neon lime in 45 inch and 54 inch lengths. Other extra fat colors available are sky blue, gold, purple, and tan. You can wear these shoelaces with or without a knot. Their extra wide length does a pretty good job of holding the uppers together over the tongue, and you can tuck in any excess lace by putting them around and inside the top eyelets so that the ends of the laces are inside your chucks. Wide laces give your chucks a different look.